When I said the readers couldn't see anyway, I meant the listeners couldn't see anyway [the chat box (on the podcast page)]. later note: I have changed the links so they'll open in new windows, so you can look things up and still listen. "Some people got kinda cranky with us when we kept running it," but I meant "stopped running it." Sorry about that. I named Julie Rice-McClure as someone they've known since they were little, from that group, but Brett Henry (known to some of those who'll read this) is another one they still have regularly in their lives. How many social groups and chatgroups are you on? I said four. I think five, though. 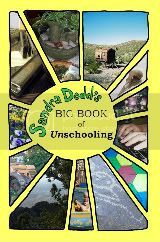 Two social-forums sites, the message board at unschooling.info/forum, AlwaysLearning@yahoogroups and UnschoolingDiscussion@googlegroups. Five, then. Three of them aren't very busy lately. If each person is as kind and generous and good as he or she can be, then the situation will be optimal. Even on a bad day, if everyone is being as generous and kind as they are capable of it is better than if they aren't. When I talked about addressing other parents in stores I said "grocery store" but I wish I'd just said "store." One was Target, one was at the library, and one was at Lowe's, and one was in Walmart. The neighbor problem was over the fence once and in the vacant lot near our houses another time. Here's something for those who might not know what owl pellets are. I got cut off, maybe by the podcast site. That's okay. The thing I was saying when I knew I'd been disconnected was that blogs are a great way to learn more about other families' unschooling experiences, with photos. I was giving the address of this blog. So never mind that; here you are, and you already know that blogs lead to other blogs! Try not to learn. Don't try to learn. Those two aren't the same thing but they're close enough for beginners. I thought you sounded great! I tuned in at the very end and then listened to the rest when the live talk ended. I'm so glad you called her almost right away and that you were able to talk to the end. It was cool to hear the history of your unschooling decision and LLL. That is how I came to homeschooling as well. I read your book a few years ago, but I don't think some of these stories were in there. I could be wrong. I enjoyed it. I also enjoyed hearing your voice for the 1st time and I look forward to meeting you and hearing you speak out here in San Diego next year! I wanted to add to the chat (I wasn't registered at the moment), another way to connect with other RU families, that our unschooling park group has just started doing, is a family park day once a month on a weekend day, so that dads, significant others or other family members (my mom came once) could come and hang out and get to know everyone too. I'm looking forward to San Diego too! I've been there very briefly a couple of times, but it will be nice to be there long enough to get the feel of where I am. The one above is more natural and conversational than either of those, though. I loved the show. I finally got to hear what you sound like. I hope to meet you in person some day. Can the world be ending *again*?